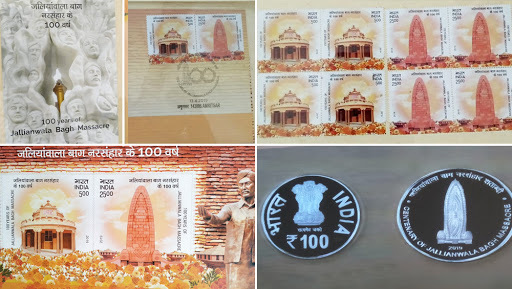 Amritsar, April 13: India Vice-President M Venkaiah Naidu on Saturday released the commemorative postage stamp at the Jallianwala Bagh memorial on commemoration of 100 years of the massacre. The Vice-President also released coins of Rs 100 with "Centenary of Jallianwala Bagh Massacre" written on it and the memorial drawn on it. Jallianwala Bagh Massacre Centenary: 100 Years Ago, British Raj Committed Worst Bloodbath and Inflicted Most 'Shameful Scar' on its History. The postage stamp also bears the image of the Jallianwala Bagh memorial and one of the stamps is dedicated to the martyrs who lost their lives in the massacre 100 years ago on this day. Jallianwala Bagh Massacre Centenary: Punjab CM Captain Amarinder Singh, Governor VP Singh Badnore Participate in Candle Light March. Prime Minister Narendra Modi and Congress President Rahul Gandhi on Saturday paid homage to hundreds of people, who were massacred by British forces at Jallianwala Bagh in Amritsar on April 13, 1919. In a tweet, PM Modi said valour and sacrifice of martyrs will never be forgotten. The Year 2019 marks the centenary of the Jallianwala Bagh massacre. UK PM Theresa May Expresses Regret Over Jallianwala Bagh Massacre. "Today, when we observe 100 years of the horrific Jallianwala Bagh massacre, India pays tributes to all those martyred on that fateful day. Their valour and sacrifice will never be forgotten. Their memory inspires us to work even harder to build an India they would be proud of," PM Modi tweeted. Congress chief Rahul Gandhi visited the Jallianwala Bagh Memorial in Amritsar to pay tributes to those who lost their lives.